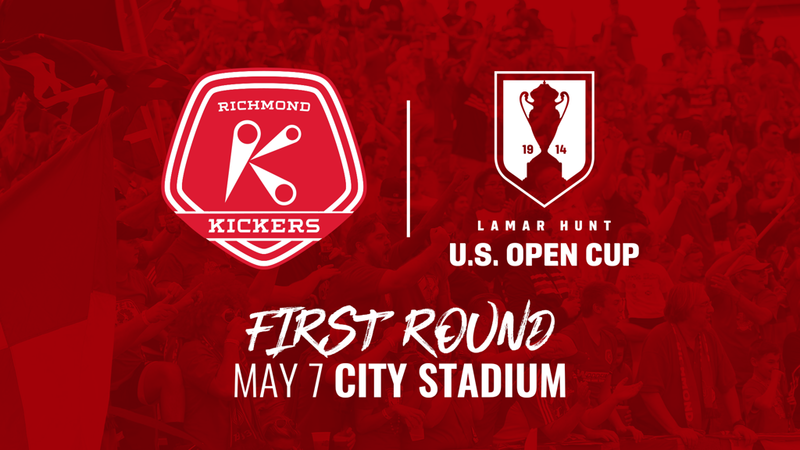 RICHMOND, Va. – (Wednesday, April 10, 2019) – U.S. Soccer announced on Tuesday the pairings for the First Round of the 2019 Lamar Hunt U.S. Open Cup. The 1995 Champions Richmond Kickers will host Virginia United at City Stadium Tuesday, May 7 at 7:00 p.m. Tickets are available now starting at $9 at RichmondKickers.com. 2019 Season Ticket holders will receive an email with a ticket for this match. Parking at City Stadium for this match will be free. The Kickers made history with their remarkable run to the semifinals in 2011. Becoming the first lower division team to defeat back-to-back MLS teams on the road, the Kickers ejected the Columbus Crew in the third round before handing Sporting Kansas City their first-ever loss at Children’s Mercy Park in the quarterfinals. Advancing to the semifinals for the second time in franchise history, the Kickers narrowly missed the Championship berth, conceding a 2-1 loss to the Chicago Fire last August. The Kickers claimed the U.S. Open Cup title the first year of the Professional Era in 1995 and have since made it to the quarterfinal round five times (1995, 2001, 2004, 2007, 2011) and the semifinal round twice (1995, 2011), ousting five Major League Soccer teams along the way, including Colorado Rapids in 2000, D.C. United in 2004, LA Galaxy in 2007 and Columbus Crew and Sporting Kansas City in 2011.